The length contraction means that an object is the longest in the frame in which it is at rest. Lets assume i have a meter stick with length $\Delta x$ in my rest frame which is $x,ct$ and i want to know how long my meter stick seems to an observer moving with a frame $x',ct'$. 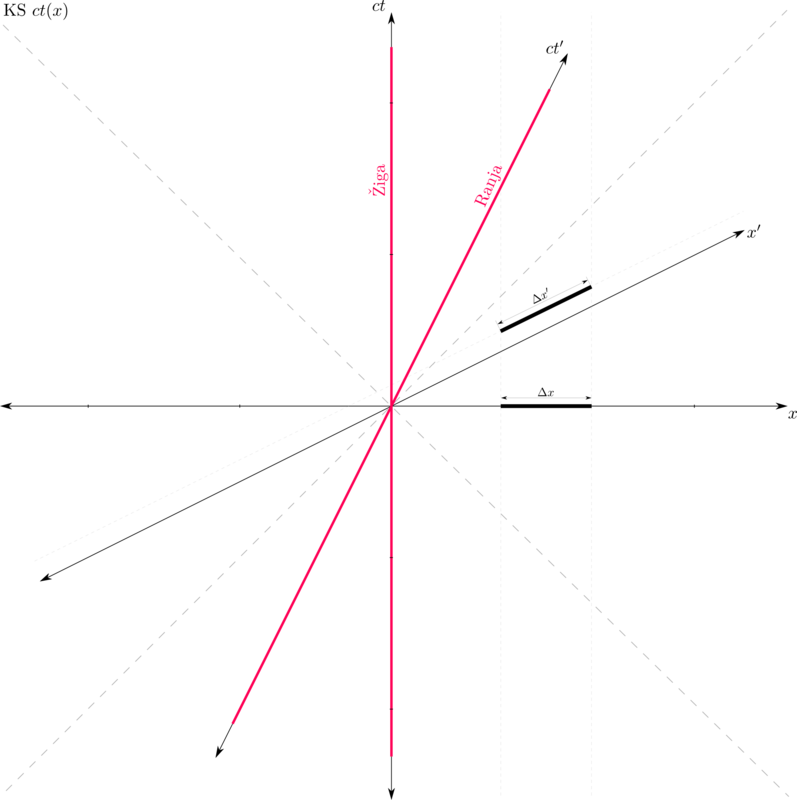 1st: I draw world lines of a meter stick in a rest frame and they are vertical (parallel to $ct$ axis) as meter stick is stationary in this frame. 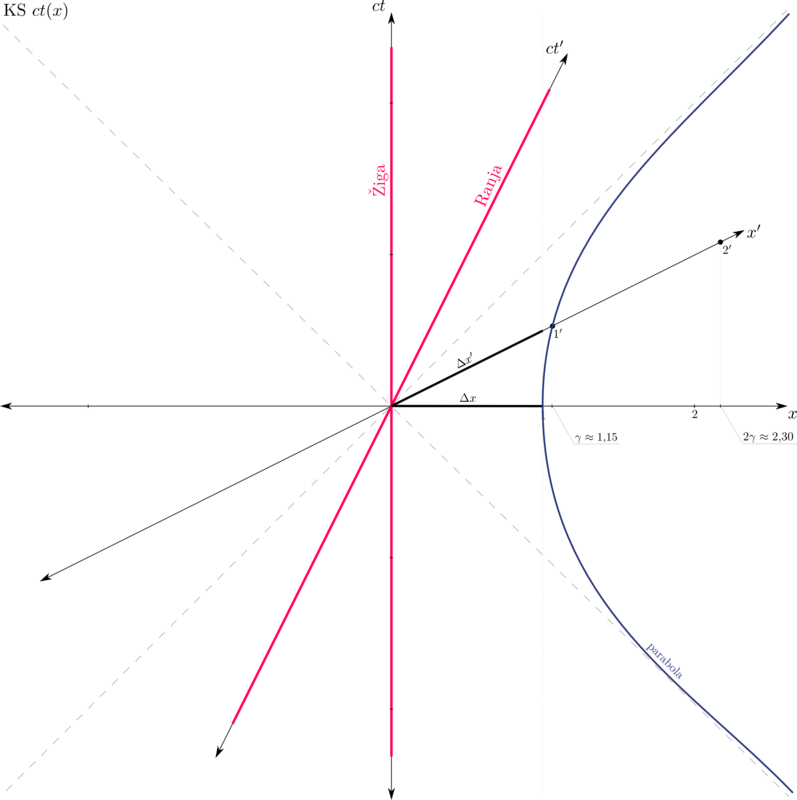 2nd: If an observer in a moving frame $x',ct'$ wants to measure my meter stick he measures its edges at the same moment in his time, so i draw a tilted line (parallel to $x'$ axis). 3rd: If i mesure the length $\Delta x'$ which is a length of a meter stick as observer in frame $x',ct'$ sees it, it seems to me that he sees a longer distance than me. This is not correct. Could anyone tell me what am i missing here? What you've missed is that the distance along the $x'$ axis is not the same as the distance along the $x$ axis. The locus of events that are 1 unit of proper distance from the origin is a hyperbola. This can be used to calibrate the $x'$ axis. See calibration hyperbola. 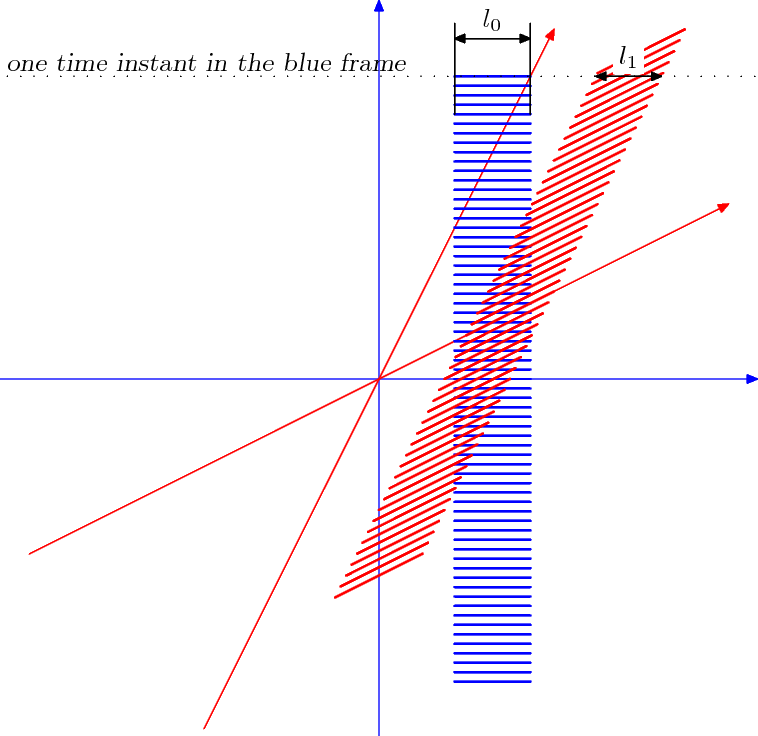 The important point is that we make a snapshot of the moving object in a time coordinate which is not its proper time. 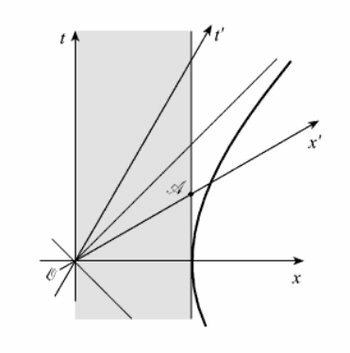 Indeed, if we drew just one image of the moving object in a cut given by $t' = \rm const.$, we would get a projection on the $x$ axis longer than $l_0$. But we must use $t = \rm const.$ instead if the measurement is done in the un-primed coordinate system. Thus, we measure the "front" of the object earlier (in terms of its proper time) than the "rear". The difference in $t'$ allows the latter to cover some extra distance, putting the two events closer in $x$. If the math is worked out, it indeed gives $l_1 < l_0$. After thinking about aditional options to explain this it returned to me, that in frame $c',ct'$ marks on $x'$ axis are further appart than marks on $x$ axis (pay attention to $1$ and $1'$). So my picture was correct from the beginning, but i didn't draw the marks on $x'$ axis. Thank you Alfred Centauri. Q: But what if a meter stick is stationary in frame $c',ct'$? I guess then $\Delta x'$ is the proper length and i have to transfer its edge points to $x$ axis using lines parallel to $ct'$ axis? Not the answer you're looking for? Browse other questions tagged special-relativity minkowski-space or ask your own question. Difference between two derivations of length contraction?